* The Flesh: Just as gravity affects our physical universe, our flesh affects our spiritual lives. On this special edition of Real Science Radio, we present a previously aired episode of Theology Thursday. Dan says you will pay me 10,000 to test some material for you. Please let me know how to collect the 10k. I could use the money, also please let me know how you would like to freight the material to me and where you would like me to freight it to for testing. Ken, maybe you've emailed the wrong person? Ah maybe, sorry if so. Very sorry, but my friend Dan is pretty worked up, I think the joke will not die... So I will send you what he says and I promise not to take any more of your important time.
" You should reply to him and tell him that you would like to date a dinosaur bone for C-14 and that you have heard he offers 10,000 dollars (link him to the video) for someone to do it. Then he will probably clarify.. "
Yes, of course, a thousand pardons Ken for not understanding you right off. - Original dinosaur and other soft tissue will be found largely independent of the claimed age of the fossil. CONFIRMED in April 2014! The Journal of Paleontology reported original soft tissue in Precambrian "beard worms" that are allegedly 530 million years old! Scientific Journals: Nature, Science, PNAS, PLoS One, Proceedings of the Royal Society, Bone, Acta Histochemica, the Journal of Vertebrate Paleontology, and others below in our chronological catalog, "the web's most complete list of dinosaur soft tissue discoveries," as published in many leading journals, according to a co-author of one of those papers. Biological Material Found: As of April 2015, in fossils from dinosaur-layer and deeper strata, researchers have discovered flexible and transparent blood vessels, red blood cells, many various proteins including the microtubule building block tubulin, collagen, the cytoskeleton component actin, and hemoglobin, bone maintenance osteocyte cells, pigment and evidence of melanosomes, DNA-related histone proteins, and powerful evidence for DNA including positive results from multiple double-helix tests. Dinosaur and Dinosaur-Layer Creatures: The dinosaurs and other Mesozoic creatures that have yielded their biological material are hadrosaur, titanosaur, ornithomimosaur [ostrich-like dinosaurs], mosasaur, [bird-like] Anchiornis huxleyi, triceratops, Lufengosaurs, T. rex, and Archaeopteryx. 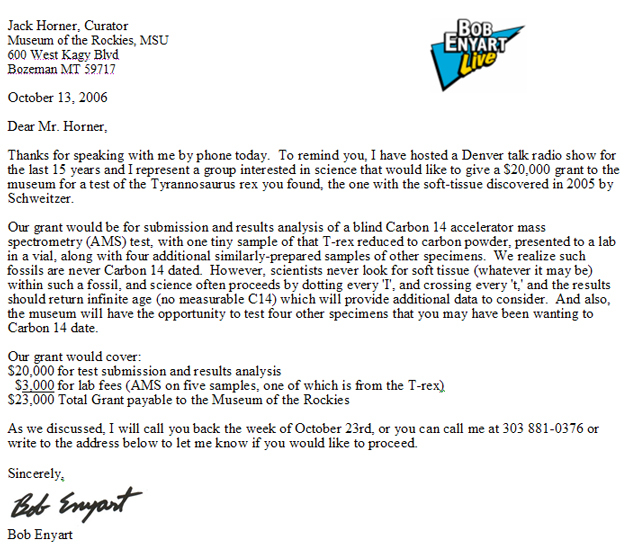 As you view the exciting scientific discoveries below in this chronological catalog, please feel free to listen to Real Science Radio co-hosts Fred Williams and Bob Enyart observe their annual tradition of presenting dinosaur soft tissue and other amazing discoveries including short-lived left-handed amino acids, DNA, and Carbon 14, all in bones and other specimens from dinosaur-layer Mesozoic and even deeper strata. And finally, as you probably know Ken (although Dan might be a bit slow on the uptake), and as first realized by Libby when he discovered carbon dating, if we can identify carbon 14 atoms that are actually a part of the collagen protein lattice, then they cannot be contamination, but have to be original 14c, which, when we document that in dinosaur protein, then everyone who is anti-science will tightly close their eyes, but everyone else will then have even more incontrovertible evidence that dinosaurs are young, all of them. And, when they lose the dinosaurs, they lose it all. Because dinosaurs have become missionary lizards. For dinosaur soft tissue means that the secular worldview is wrong, which leaves only one man standing, and that is Jesus Christ, who is God.